My R51 was among the first Gen 2 releases that had reconditioned Charlotte frames. It has never been easy for me to remove the barrel from the slide once the bushing is moved into the notch and the barrel is canted upwards. Getting the barrel back in is equally challenging. I've seen the videos that make it look easy, which makes me wonder if there is something sticky or edgy in my pistol that makes it more difficult. Has anyone had a similar experience and been able to come up with a remedy? Granted, this is just somebody's guess, but it could happen. Your thoughts? There is quite a house cleaning going on - and it can't all be related to the general downturn in firearms sales after the defeat of Clinton. This article is generally positive and goes into excruciating detail regarding the Pederson block. "...I was most interested in seeing how the new R51 shot... There were problems with the first two magazines. The pistol would not efficiently strip the top round out of the magazine and feed it into the chamber. After a fair amount of effort expended, including several trips to the range, I gave up and reported the problem to Remington. In short order, I received new magazines. With a variety of ammunition, I headed back to the range and enjoyed a morning of completely trouble-free shooting. The gun functioned perfectly with the new magazines." The American Rifleman conducted what they called the "Ladies Pistol Project II - Concealed Carry Pistols." 55 women tested 24 pistols and their subjective feedback was tallied and analyzed. Since the R51 was included in the evaluation, I thought the results might be of interest to this audience. First, we all know the struggles with breaking in an R51. For example, if participants weren’t explicitly instructed to use the slingshot method to load a full magazine, they might have deducted points for difficult slide manipulation. Or if they didn’t know about the combat sight picture aiming, they might not have felt the pistol was accurate. Second, the R51 is competing against a lot of high quality, nice shooting, conceal carry / compact / subcompact pistols. And although American Rifleman tried to collect subjective data in an objective manner, I have to believe there were instances where the R51 suffered by comparison. The movie "Back to the Future 2" promised we'd have hover boards in 2015. That didn't happen. Remington showed us an R51 with suppressor in 2014, but we didn't get that either. Is there any speculation why? I don't understand completely how semi-automatic pistols function, but my guess is that hanging a can off the front of the R51 degraded function/performance such that the idea was scrapped before or during retooling. 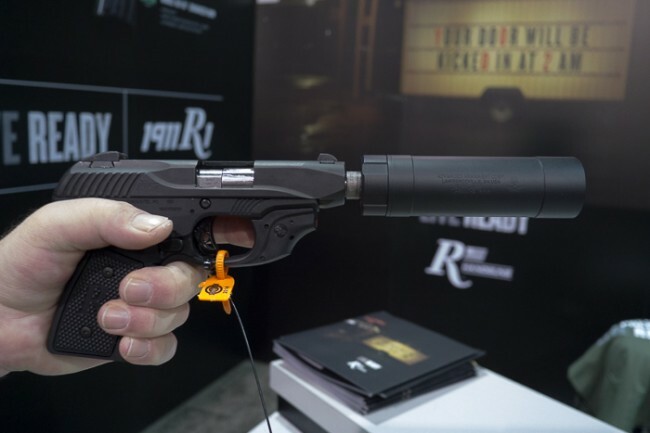 I'm just wondering if the original hand-built, pre-Shot Show 2014, Gen 1 R51s ever worked with a suppressor or if was it marketing hype from the start. The first 50 rounds of Remington FMJ ran pretty much flawlessly. I didn't have the same luck with the next 250 rounds of Winchester White Box. The slide wood get stuck back on virtually every magazine of WWB. This occurred on the first first, second, and sometimes third and fourth round of each magazine. The gun wasn't locked up as it only took a slight tap on the back of the slide with my thumb for the pistol to return to battery. I also had a handful of stovepipes with the WWB. I mostly inserted full magazines into the pistol with the slide locked back. In using the slingshot technique to chamber a round, I needed to give the slide a little push to get it to close. I also found that I was able to rack the slide on a full mag. It wasn't completely smooth, but at least I was able to do it. I was disappointed most to discover that mine shoots about 2" low at 12 yards (at least with WWB). Reassembly was not quite a difficult, but the bushing gave me similar problems going back in. Maybe I'll get the hang of it after a few more times. I can't wait to try it with different ammo. No more WWB for this R51. Although many retail stores in my area still hang $449 price tags on their R51's, at least one shop posted an internet price below $300. I cross checked this with BudsGunShop.com and he is under $300 too. Plus Remington is offering a $50 rebate on the R51 through 7/30/2017 (limit 5). It might be time to stock up! R51 General Discussion / Purchase a Used R51? Would you purchase a used R51 - in like-new condition - from a gun shop? Remington's limited lifetime warranty is not transferable to the second owner. Does anyone have interest in or experience with the Remington RP9? I really like the innovations and features Remington is trying to bring to market with their new pistols, but they seem to continue having problems. I’m wondering if the criticism of the RP9 is deserved or is a carry-over from the botched R51 release. I’ve read the left-side button of the ambidextrous slide release flexes and does not function due to a design flaw and the pistol is subject to nose dive failures that lock up the slide when the mag is loaded to capacity. You can argue about whether or not a pistol produced in a modern factory should need a break-in period and decide on your own if you want to spend your money on one that seems to need one, but I’m wondering about this in the context of the RP9. Does it simply need a break-in or does the high capacity mag/thin grip design [again] introduce “tolerance stacking” issues in production such that some pistols are more prone to feed failures? I’m just wondering if you guys have any opinions or heard any scuttlebutt. I finally found a range that had an R51 to rent. I was also able to shoot it side-by-side with the Walther CCP, M&P Shield, and Glock 43. I've only been shooting pistols for a couple of years so I won't pretend to offer any expert reviews. I'm just learning what I like and don't like. Here's my two cents. I like the grip ergonomics of the CCP better than the R51, but I can't say that the delayed gas blowback system of the CCP reduced recoil any more than the R51. The sights on the CCP had small dots which were hard to pick up. In general, I liked the CCP, but not as much as the R51. I didn't care for the M&P Shield so much. I know it is feature rich and lots of folks like them, but the grip was too thin for my taste and I didn't like the trigger. I liked the Glock 43 more than I thought I would, but I prefer a pistol with a bit more size and heft. The R51 had a Charlotte frame. It didn't have any failures and I was able to rack the slide on a full mag. I'm not a particularly good shot, but after I decided I liked the R51 best of the bunch, I tried to bear down and see how good I could shoot it. At 15 feet I was able to put 10 rounds in 2" and there was a decent group high and left. At 25 feet I put 20 rounds in a 4" circle. I'm not sure if this question has been asked or answered on this forum. As I understand it, the Gen 2 pistols are built in Huntsville, but because they wanted to use up their stock of Gen 1 frames, initial Gen 2s were stamped as being manufactured in Charlotte. And after all of the original Gen 1 frames were rebuilt, all subsequent R51s would be stamped Huntsville. Has anyone heard of or experienced any quality or performance issues - good or bad - that can be attributed to the original versus new lot of frames? Man, I want to see this gun succeed. I’m consuming every scrap of review, video, and feedback I can find. This site seems to be the best source for information. So far it looks like some folks are having problems and some aren’t, which isn’t completely different from the initial release (although the ratio of functional pistols to lemons is probably flip-flopped). I’m paying close attention to which problems seem to reoccur and how Remington deals with them.